Since Governor Pat McCrory took office in January, the unemployment rate in North Carolina has dropped from 9.5% to 8.0%. Though still a far cry from the 5% rate in January 2008, the drop suggests a significant improvement in the job market. In a speech earlier this week, McCrory seized on the rare positive headline and credited his administration for the lower rate. Considered alone, however, the unemployment rate is misleading. When you consider the labor report as a whole, it actually reveals a negative employment trend in NC. According to the Bureau of Labor Statistics, there are 29,000 fewer people employed now than at the beginning of the year. During the same period, the labor force shrank significantly — by 110,000 (2.3%). These numbers indicate that the rate has declined, not because new jobs have been added, but because unemployed workers have left the labor force and are no longer counted as officially unemployed. Of the jobs that are being added, most are in low-wage sectors of the economy. In his speech, McCrory attributed the falling unemployment rate to “tough decisions” made by the Republicans, such as slashing unemployment insurance benefits, cutting taxes on the wealthy and rejecting federal subsidies to expand Medicaid. Apart from the specious premise that the job market has significantly improved, the argument that these cruel policies would ease the labor crisis is thin. 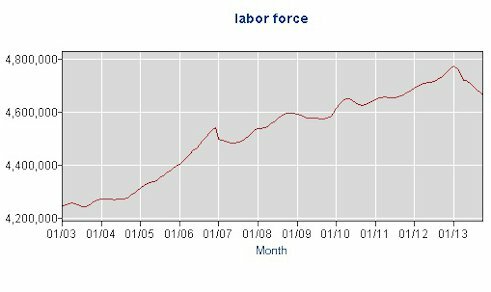 The labor force has declined since January 2013. This entry was posted on at 6:47 pm, filed under Economics, Misc. and tagged #ncpol, Bureau of Labor Statistics, McCrory, NC unemployment, unemployment rate. Bookmark the permalink. Follow any comments here with the RSS feed for this post. Both comments and trackbacks are currently closed.